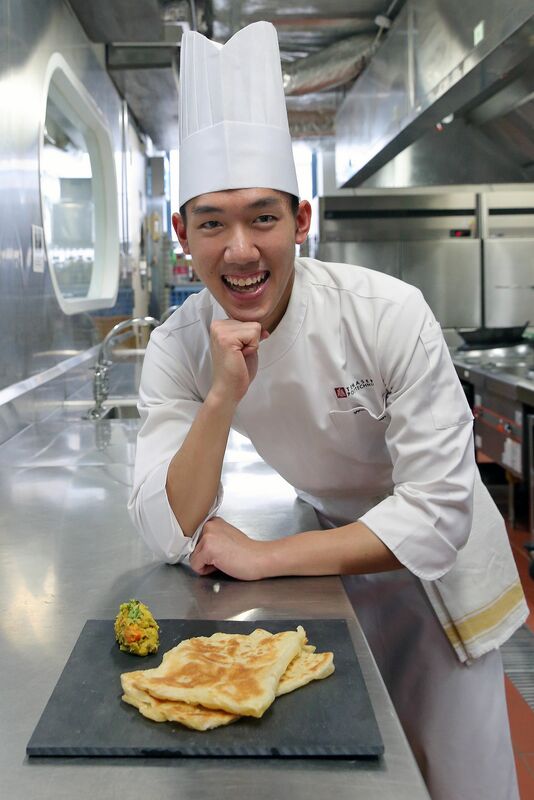 He cooks Western dishes such as potato gratin and chicken roulade with foie gras and parma ham with ease, but when he had to make roti prata for a school project two years ago, culinary student Wong Ju Lih was clueless. Then a final-year student in Temasek Polytechnic's baking and culinary science diploma course, he had to figure out how to make the crispy flat bread. So, he visited eateries such as Al-Ameen Eating House in Cheong Chin Nam Road and The Roti Prata House in Upper Thomson Road six times in a week, to observe how the dough was stretched and tossed. He spent about two hours in total standing by stoves to observe cooks flipping prata. The 22-year-old bachelor recalls: "I could not catch up with the quick movements I watched in online videos, so the best way was to see it up close." His recipe for roti prata is one of 25 in the cookbook, Singapore Hawker Classics Unveiled, published by Marshall Cavendish. The book contains step-by-step cooking photographs and nuggets of information on the history and science of cooking these popular main dishes, snacks and desserts. Dishes include Hainanese chicken rice, Indian mee goreng, satay, ondeh ondeh and chendol. The cookbook was launched last month by Singapore ambassador- at-large, Professor Tommy Koh. Supported by the National Heritage Board, the book aims to preserve time-honoured recipes of well-loved hawker dishes and share them with the younger generation. The recipes were developed by Temasek Polytechnic's final-year students from the baking and culinary science diploma course and its faculty over five years. Now a first-year culinary arts management undergraduate at The Culinary Institute of America, Singapore, Mr Wong recalls that it took him more than 15 attempts to nail down the proportions of ingredients and experiment with how long to rest the dough to properly develop its gluten. 1. Add plain flour, salt and sugar into a mixing bowl and mix well. 2. Add water, eggs and corn oil into mixture and mix till sticky clumps form. Set aside for 30 minutes. 3. Knead the dough by hand for 10 minutes till it becomes firm. 4. Place dough in a bowl and cover it with a damp cloth. Set aside for 30 minutes. 5. Knead dough for another 10 minutes and divide into 100g portions. Roll each portion into a ball. Coat each ball with a layer of oil to prevent them from sticking together. Place dough balls on a tray, cover with cling wrap and refrigerate overnight. 6. When ready to cook, remove tray from fridge and let dough sit at room temperature for 10 minutes. 7. Oil a flat surface and flatten a ball of dough with your palm. 8. Hold two edges of the dough anchored by your thumb on the front and four fingers on the underside (below). Flip it in a anti-clockwise direction , rotating the dough six to eight times till it becomes well-stretched and thin. 9. Once it is stretched out, fold the edges outwards to ensure uniform thickness at the sides. 10. Coat the surface of the dough with 1/2 tsp of corn oil. Fold the dough inwards from the four sides till they meet in the centre. 11. Repeat steps 7 to 10 for the remaining dough balls. 12. Add 1/2 tsp of corn oil to a non-stick pan on medium heat till the oil sizzles. 13. Place the folded dough in the pan with the seams facing upwards. Fry for one to two minutes till it turns golden brown on each side. Use a spatula to press down sides to ensure that they are cooked. 14. Cool for one minute before fluffing up the roti prata by pressing the sides towards the centre in a quick clapping motion. Serve with curry. This allows the dough to be stretched as thin as possible without tearing. He says: "It is a love-hate relationship with the dough. 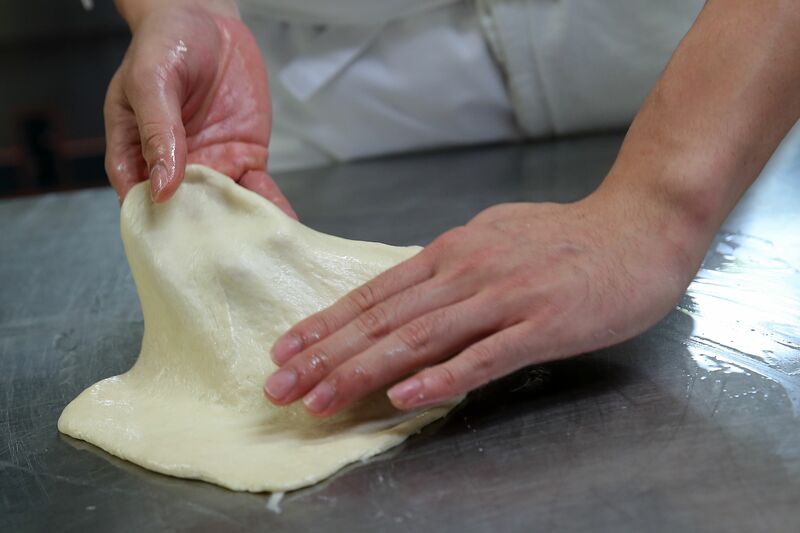 While it can be therapeutic to knead, it is frustrating when the dough tears apart while being flipped." He also tweaked the recipe by replacing ghee with corn oil as "it is a healthier alternative". However, this causes the roti prata to become less crisp and flaky. Working on the cookbook has made him see the dish in a new light. He says: "I used to just enjoy it as a meal, but I now have a deeper appreciation for hawker food as I know more about its rich history. I feel proud that it is part of our food culture." The second of four children has cooked Hokkien mee, char kway teow and chicken rice at home, on top of making dishes such as chocolate lava cake, pasta carbonara and prawn and vegetable tempura for his family on weekends. His father, 57, does missionary work for a church and his mother, 51, is a relief teacher. When asked if he would consider becoming a hawker, Mr Wong says he has set his sights on working in fine-dining restaurants in the United States, such as Eleven Madison Park in New York City. "Opening a hawker stall can be hot and tough," he says. "I prefer the fine-dining route, so that I can learn from the best in the culinary world, add my own flair and bring that back home." Singapore Hawker Classics Unveiled costs $34 and is available at major bookstores and e-book retailers.